Innovate Carolina 2011 – This time, in Charlotte! 2 min mindmap advertising akoha amelie's bakery area 15 arts and creativity asc barcamp charlotte Ben Craig Center bernie madoff BOLT Group boomers brainstorming branding career services charitable needs Charlotte charlotte business journal Charlotte Magazine Charlotte Observer Charlotte Talks charlotte viewpoint community services consumer behavior cpcc Creative Vitality Index creativity crowdsourcing dan pink data visualization delighters design research design thinking empathy entrepreneurship enventys extreme constraints facebook fail fast financial services firefighters health care hyperlocal ideation innovation Innovation Institute innovative teams library mad men media mindmap Mission Possible NY Times product development Queen's Feast recession marketing restaurant menus restaurants retail and restaurants science and technology social media sports steak stickk sustainability tedxcharlotte the 60's transparency twitter UNCC utilities volkswagen ads wachovia WFAE what if? 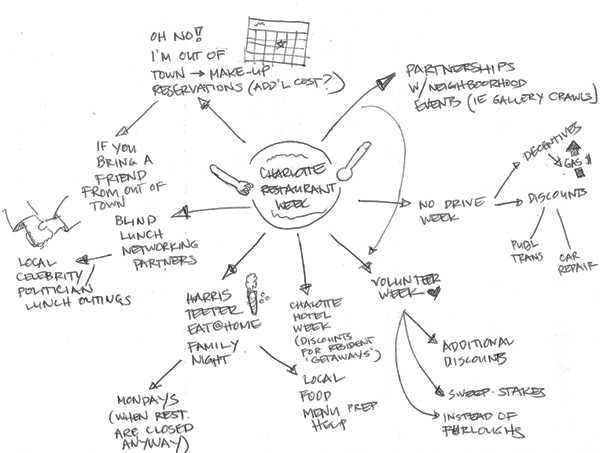 For some reason, my mindmap over the summer about Charlotte Restaurant Week got lots of hits, so I thought I’d revisit the topic. The winter version of the event is here once again, and like many Charlotteans, I will put my New Year resolutions on hold to participate. Why is it so successful? It’s great for restaurants because it fills empty tables during a slow period. The scarcity of a $30 deal at a fancy restaurant will sucker any diner into trying something new. Personally, I like it because it’s another reason to bring people together. But it also cuts down the number of decisions I have to make when ordering off of a menu. This reminds me of a little publicity blitz by Menu Engineer (that’s right, an engineer) Gregg Rapp went on last fall. His interviews with Time and the Today Show reveal all the tricks he teaches restaurants as they redesign their menus to get you to spend more on your meal, including using center justification and taking out dollar $igns. He also uses fanciful descriptions that make their popular dishes hard to resist. You don’t often get to read a person’s mind as he/she processes a menu to see if these tactics work. This Charlotte Loafing blogger shares her mental gymnastics on one of Restaurant Week’s participants, Liberty Gastropub, and it looks like the tasty descriptions work on her. In honor of Charlotte’s Queen’s Feast restaurant week, I decided to create a 2-minute mindmap to have fun with the concept. Feature improvements Ways to enhance the consumer experience of Restaurant Week via scheduling and restaurant selection tools, engaging marketing campaigns, etc. Extended partnerships Mutually beneficial business partnerships with local institutions to bring additional revenue and visibility to other areas of the city. Other “weeks” Applying the restaurant week concept to other industries, collectives, or social movements to celebrate and bring greater focus to them. On a more tactical level, one of my favorite writers/economists Tyler Cowen offered a few strategies for Restuarant week in an old article in the Washington Post.